Winner of the Grand Jury Documentary prize at the Sundance Film Festival, Syrian filmmaker Feras Fayyad’s breathtaking work – a searing example of boots-on-the-ground reportage – follows the efforts of the internationally recognized White Helmets, an organization comprised of ordinary citizens who are the first to rush towards military strikes and attacks in the hope of saving lives. Incorporating moments of both heart-pounding suspense and improbable beauty, the documentary draws us into the lives of three of its founders – Khaled, Subhi, and Mahmoud – as they grapple with the chaos around them and struggle with an ever-present dilemma: do they flee or stay and fight for their country. 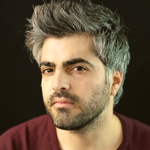 Feras Fayyad is an award-winning filmmaker. He was twice held by Bashar Assad’s intelligence because of his film “on other side.” He studied filmmaking and arts and has directed and edited several films, both documentary and fiction.